Find a picture or pennant from your alma mater among the sports photos and memorabilia that cover the walls and ceiling. Enjoy seven TV 's, Keno and Poker machines, delicious food and live poker game every night. Throw your peanut shells on the floor. This is a saloon - nothing fancy about the Bulldog. 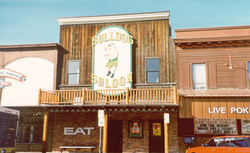 Directions: The Bulldog Saloon and Grill is located in the heart of downtown Whitefish. Just look for the big sign of the boxing bulldog.